Despite the diversity of wasps (over 100,000 species), their life cycles are remarkably similar. Wasps are typically divided into social and solitary wasps and this is a useful distinction for wasp life cycles as well. The approximately 1,000 species of social wasps, which follow the same general pattern of nesting behavior, development, and lifespan. The rest are solitary, and while some lay their eggs inside the body of another insect and others build nests, they are also united by a similar life cycle. So, how do wasps reproduce? Like other insects, wasps lay eggs. If you’re wondering, “How long to wasps live?”, the answer is about the same for all types of wasps. The average lifespan of a wasp is typically about the length of a season or 3 to 6 weeks. The most common social wasps are paper wasps, yellow jackets, and hornets. Their populations are characterized by colonies within papery nests either above- or below-ground composed of hexagonal cells for their larvae. These colonies typically only last the spring and summer and are not used again. However, in areas with mild winters, nests can be used for a year or more. As spring begins, females that mated the previous fall emerge from the shelter in which they overwintered and go in search of a suitable nesting site. Once a site is found, these queen wasps begin to build a small nest. (For more information on nests, see our article “Wasp Nest Identification”.) In some paper wasp species, several females will start a colony together with one eventually emerging as the dominant queen and the others reduced to worker status. Queens lay eggs in the cells of their nests, which hatch into larvae. The queen hunts insects, such as caterpillars, flies, grasshoppers, crickets, and even other wasps. She kills the insects, chews them up, and brings the slurry back to the nest to feed the larvae. 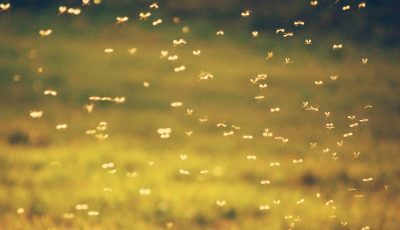 The larvae, or baby wasps, are white, legless, and grub-like. Once they reach their full larval size, they make a silk cap for their cell and mature into an adult wasp (pupate). During this pupal stage, they become darker and segmented and grow their wings and legs. The process, from wasp egg to larva to pupa to adult, takes about a month, at which point adult workers emerge from the nest. The workers are sterile females and their job is to make the nest bigger and provision the rest of the eggs the queen lays. 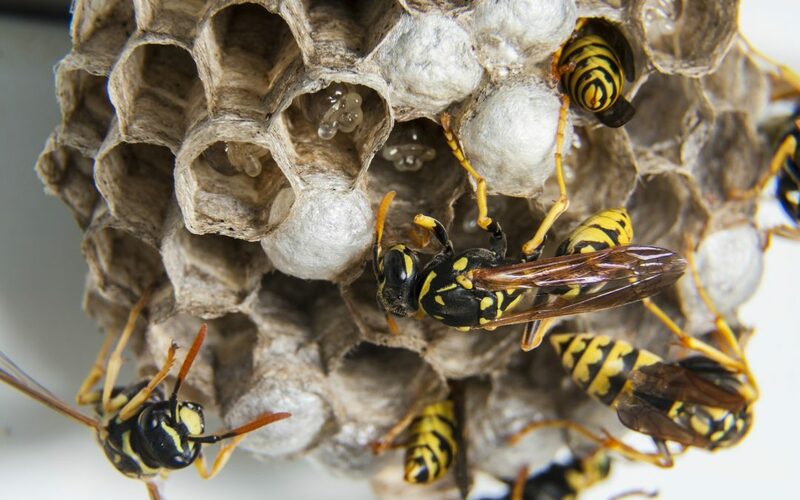 Paper wasp nests tend not to be larger than an open hand and hold between 15 and 200 individuals, while yellow jacket nests grow much larger and can have between 1,500 and 15,000 individuals. Hornet nests lie in between, usually reaching populations of 300 to 1,000. As the summer progresses, the workers feed themselves and the queen as well as the larvae, but to a lesser extent. Adult wasps eat nectar and other sugary substances. As the queen begins to lay fewer eggs and the average age of the colony is older, late in the summer, wasps begin to forage more heavily for themselves. This is the time when they become a nuisance to people on picnics or enjoying a sugary drink on the back porch. Also near summer’s end, the queen lays the eggs which will become the next year’s queens and lays unfertilized eggs, which mature into males. Future queen cells are provisioned more than others. Fertile females and males leave the nest to find mates. After mating, the males die, and the fertilized females find a sheltered place (under tree bark, in building crevices or burrowed underground) to hibernate through the winter. As cold weather sets in, the rest of the colony dies. Solitary wasps include mud daubers, cicada killers, and the non-stinging parasitic wasps. They differ from social wasps in that they do not form colonies. Instead, each female nests alone, providing food for her larvae before they hatch rather than progressively provisioning them after. Mud daubers emerge from pupal cases in the spring (except in the tropics, where they are continually active), then leave the nest to find a mate. Once fertilized (typically within 48 hours), females of most species gather mud and build their nest one cell at a time. One species, however, the blue metallic mud dauber, uses the nests of other mud dauber species rather than building its own. Once a cell is complete, the female begins hunting for spiders, which she paralyzes with the venom of her sting and brings back to the nest. She lays an egg on one of the spiders and continues packing the cell full of spiders. 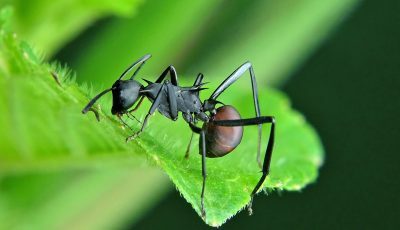 A single mud dauber cell can contain as many as 25 paralyzed spiders. Once the cell is full, she seals it up and begins a second cell. Black and yellow mud daubers typically build nests of up to 25 cells, while the organ pipe mud dauber builds up to 6 long pipes composed of multiple cells each. The organ pipe mud dauber does something a little different. Unlike other wasps, the male stands guard over the nest, preventing intruders, including parasitic wasps and other males. At the end of the season, usually, 3 to 6 weeks after emerging from the nest, the adult wasps die. Organ pipe mud daubers are a little different in this case, as well. Some overwinter as larvae, while others overwinter as adults and begin the reproductive cycle in the spring. When the eggs hatch (usually after 1.5 to 3.5 days), the wasp larvae feed on the paralyzed spiders. They typically finish them off over the course of 1 to 3 weeks, depending on temperature. When the temperature drops, the larvae, now in their pre-pupal stage, go into diapause until the weather warms up again in the spring. Once the temperature rises, the larvae spin their cocoons and undergo the final stage of development before emerging to continue the cycle. Cicada killers have a similar life history to mud daubers, except that they dig burrows in which to lay their eggs and they specialize on cicadas, rather than spiders. Each cicada killer burrow cell contains one egg and two or three cicadas. Eggs hatch in 2 to 3 days and the larvae feed for around 2 weeks before pupating. Like mud daubers, they emerge from the burrow in the spring to begin reproducing. 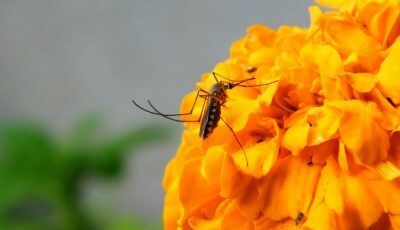 Finally, parasitic wasps lay their eggs on or inside the bodies or eggs of host insects, such as caterpillars, aphids, sawflies, beetles, leafhoppers, thrips, and flies. Once the eggs hatch, the larvae consume their host, pupate (either externally or within the remains of the host), and emerge to produce the next generation. Although wasp species number in the hundreds of thousands, their life histories roughly fall into two categories depending on whether they are social or solitary. There is a bit more diversity within the solitary wasps. However, once you determine if you’re looking at a social or solitary wasp, you can figure out what role it plays in its population and in your garden.